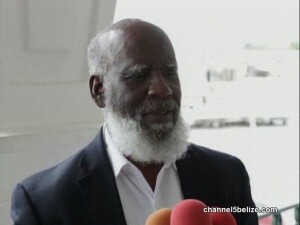 Senior Counsel and Government Minister Wilfred Elrington has been taken to the Caribbean Court of Justice in respect to his personal handling of a case for a company, Progresso Heights Limited, of which he is a shareholder. The court has told him as principal in Pitts and Elrington law firm to return several land title documents for land sold by the company for which they took purchase price. But in about half the cases the documents and monies paid for land in the Corozal District subdivision was not returned, and there was a question as to who actually received the documents at the firm. Elrington, who has been both Attorney General and Minister of Foreign Affairs, says he personally was not aware of what was going on and appeared at a loss as to what to do next. Senior Counsel Eamon Courtenay appeared for Progresso Heights Limited.